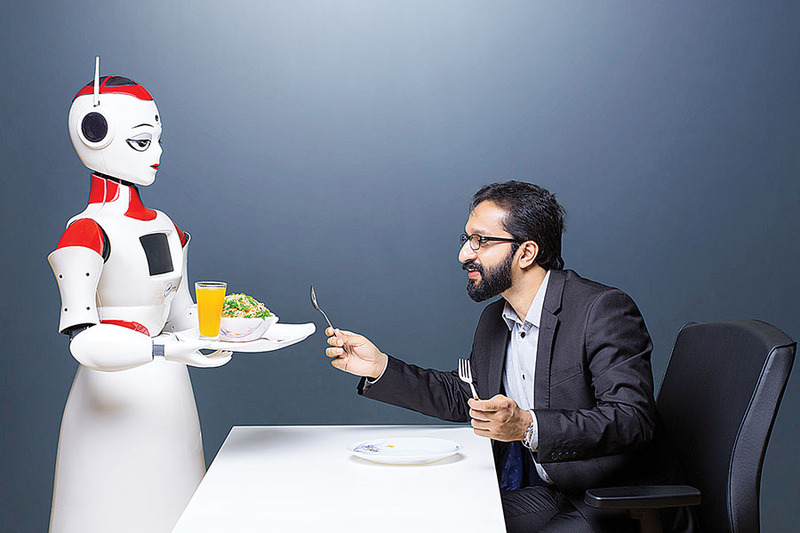 Robots are now an integral part of the hospitality, banking and health care sectors. To tackle the avalanche of consumer complaints that these industries face, ASIMoV Robotics, an Indian startup founded in 2012, is deploying robots. One of its flagship products is a robot called ‘Sayabot’, referred to as ‘Saya’, which is also its wakeup code. ASIMoV is the brainchild of Jayakrishnan T, who has about 24 years of experience in the IT industry and 12 years in robotics. “I wanted to build robots that can work alongside people,” he says, adding that he launched the company with an initial investment of ₹60 lakh. The startup provides robotic arms and manipulators, as well as platforms, and design consultancy in robotic simulation and control, machine-vision, training, virtual reality and navigation applications. “We work with companies that need help in designing hardware; if they have the hardware, they need assistance in adding intelligence. ASIMoV also designs robotic configurations for clients as per their requirements,” says Jayakrishnan, CEO and founder. Customers include TCS, Cognizant, Accenture, Samsung, HCL, DRDO and HDFC Bank. The company’s robot arms cost between ₹3 lakh and ₹15 lakh while the Sayabot is priced between ₹20 lakh and ₹30 lakh, depending on the degree of customisation. ASIMoV has customised Sayabot to work for hospitals, banks, hotels, airports, corporate offices, retail stores and remote education. It is a humanoid torso on wheels and can help with personal assistance (guidance , information, physical assistance), engagement, safety and security, surveillance and tele-operations. Each of these functions is customised as per customer requirement. “AI and machine learning are used for autonomous navigation, gesture and speech recognition and battery power management,” says Jayakrishnan, 46. In the future, he plans to shift the focus entirely to health care because of its potential. “We are working on tackling an existing problem in the market—caregiving. We feel robots could be the solution. From providing physical support and medication reminders to monitoring patient health, a robot could do it all,” he says. 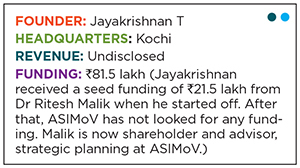 Jayakrishnan hopes to tie up with Indian health care organisations as well as companies in the US. Recently, it received ₹48 lakh from the central government for research on a minimal invasive cutting technology for craniostenosis—a condition that affects the skull development of a foetus.